It's Lovely! I'll Take It! 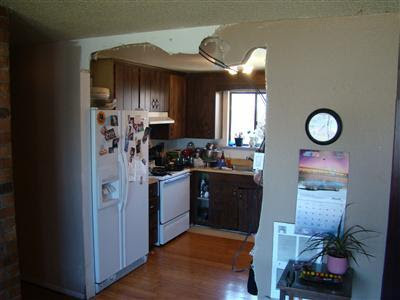 : "4 Bedroom Rambler and 1 Bath - Needs some TLC"
...previous tenant was a giant pitcher of Kool-Aid. 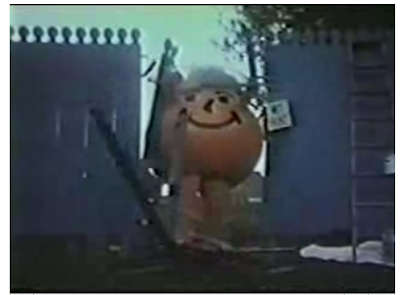 The Kool-Aid isn't from the listing -- it's just illustrating the only explanation I can think of for that doorway. And we can see by that other lovely photo that the previous tenant had a few pair of shoes also... or maybe they're just proud of the unfinished flooring. looks like they gave up halfway through knocking down that wall. I fear they're on to you -- posting joke pictures to get on your blog, which has to drive the hits through the roof. Oh, the Kool-Aid pitcher wasn't on the listing. That's just me. Is it just me, or is the house highlighted in the aerial view about twice the size and a block away from the PIQ? Best post since the Tetris/Japanese Game Show house! At first I thought I was looking at some really crummy photoshop work but after staring for a while my brain is finally able to make sense out of the photo and I'm guessing there was a sawzall involved and that there's also a person in the hospital who is probably missing some parts. I'm gonna guess the Kool-Aid man wasn't the culprit -- I saw no red-colored stains anywhere from the inevitable splashing that occurs. No, my guess is that giant red-orange hairy monster from the Bugs Bunny cartoons. Mom just didn't get what she's was saying, "yes" to when the kids asked if they could invite a new friend over for dinner.